"Easy and delicious. Great for a party or just as a snack. A wonderful way to use apples." In a medium bowl, stir together the flour and salt. Cut in the 1 cup butter until mixture is mealy. With a fork, stir in the 2/3 cup milk and egg yolk. Divide dough into 2 equal parts. On a lightly floured surface, roll out 1 piece of dough into a large rectangle. Place on the bottom of a 9x13 inch baking pan. Sprinkle cereal over the crust, then layer the apples over the cereal. 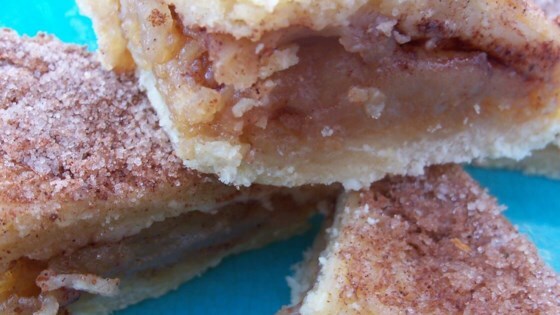 Stir together the 1 cup of white sugar, and the 1and 1/2 teaspoons of cinnamon and nutmeg; sprinkle over the apple layer. Roll out the other half of the dough and cover everything in the pan. Brush top crust with the reserved egg white and sprinkle with a mixture of 2 tablespoons sugar, and 1/2 teaspoon of cinnamon. Bake for 45 minutes to 1 hour in the preheated oven. Top crust should be lightly browned. Mix together the 1 cup of confectioners' sugar, 1 and 1/2 tablespoons of milk, and 1/2 teaspoon of vanilla until smooth; drizzle over bars while they are still warm. I used four good sized granny smith apples = 8 cups. I mixed ingredients and apples together in a bowl to evenly coat them. Great recipe, unlike other reviews, mine held up well for a few days.